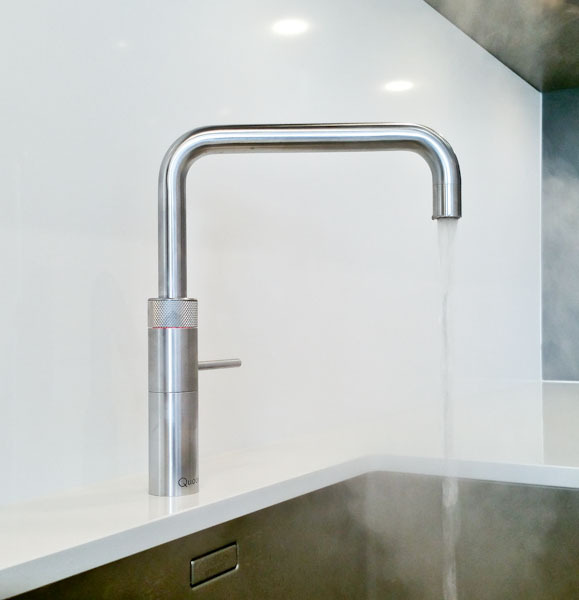 The Quooker boiling water tap is an innovative kitchen appliance that is fast becoming a “must have” kitchen item. It was designed by Dutch physicist and inventor Henri Peteri and, although comparatively new to Britain, it has been popular in Europe for many years. As our lives become ever busier time becomes more precious! Minutes saved not having to wait for the kettle to boil in that hectic morning rush will seem invaluable, as your morning brew will be ready in an instant. But the Quooker tap has many more functions too, including blanching vegetables, heating up dinner plates, cleaning saucepans, making baby formula and even peeling tomatoes. The standard Quooker boiling water tap obviously enables you to obtain instant hot water, but there is also the Quooker Combi which can be fitted to supply all your kitchen’s hot water. The Quooker tap will assist in our never ending quest to keep our kitchen worktops as clutter free as possible. Getting rid of your kettle will free up space for your blender or coffee machine. If you opt for the Quooker Fusion you will also only have one tap on your worktop to supply all your water. This is obviously a primary concern especially if you have young children, as many accidents are reported every year involving kettles. The Quooker tap however is much safer as it has a special mechanism requiring the deftness of an adult hand to operate it, making it child proof. It is usually fitted at the back of the sink out of the reach of young children. Plus, instead of coming out in a fast jet, the water comes out as a spray, further reducing the risk of accidents. The spout is double walled preventing it from becoming too hot to touch and is height adjustable stopping splashes of hot water and potential burns. Quooker quote running costs of just 3p per day due to the fact you only ever heat the exact amount of water you require, unlike a kettle which is often overfilled, boiled and forgotten and then boiled again. The Quooker Combi is installed directly below the tap in a kitchen cupboard meaning the water only has a short journey to travel giving you instant boiling or hot water whenever you need it resulting in much less waste. If you would like see the Quooker tap in action why not pop along to our Black Rok Heathfield showroom where a member of our team will be happy to give you a demonstration and discuss the various styles and types of tap available.